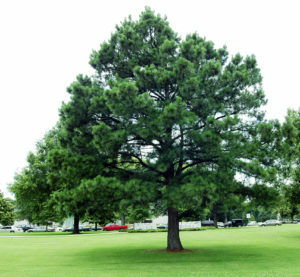 Shortleaf pine trees are native to the south-central and southeastern United States, and have the widest range of any pine native to that region. Its range extends from as far north as southern New York, as far west as east Texas, as far south as northern Florida and east along the Atlantic coastline. According to fossilized pollen records, the shortleaf pine may have grown as far north as Michigan at one time, according to the Western North Carolina Nature Center. Shortleaf pine adapts to many different soils, elevations and conditions, which is why it has such a large growth range. The fastest growing trees tend to be found in soils and climates that are relatively moist, like the coastal areas. Shortleaf pine grows at elevations as low as 10 feet along the coastline and as high as 3,000 feet in the Appalachians Mountains range. The tree does not grow well in highly competitive situations with other, more aggressive trees. A shady environment will stunt the pine tree’s growth.